By 2022, German exhibition venues plan to invest around 900 million euros in modernising exhibition halls and enhancing service quality, but also in building new facilities. They want to increase their hall space by approximately 55,000 m². Some 35,000 m² of this new space will already be available this year. These are results from a survey by AUMA – the Association of the German Trade Fair Industry – of 25 exhibition venues of national and international significance. 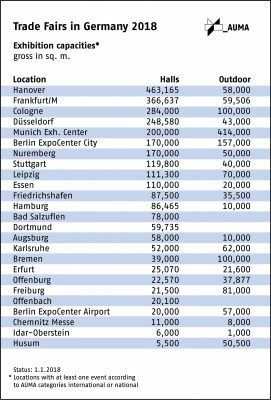 At the beginning of this year, Germany’s exhibition venues had a total capacity of 2,835,922 m² hall space, or 1.4% more than the year before (2,795,509 m²). In 2017, they invested a good 330 million euros in their exhibition and conference capacities, especially in expanding and modernising halls, redesigning and reshaping entryways, and modernising the thermal, fire protection and event tech systems. Venues of regional significance had a total capacity of 381,815 m² according to a 2017 AUMA survey, which means that Germany currently has 3.21 million m² of hall space available for exhibitions.